So I was driving the 1991 535i/m in some very hot weather the other day. With the AC on, the idle speed started jumping up and down by 200-600RPM or so. Sweet. The next day, on acceleration onto the freeway, someone hit the off switch. Idiot lights lit, motor died instantly, pulled off the road and got AAA-ed home, which was luckily like 5 miles. There was no stutter, no stumble, no cough. Just a motor that did 3500RPM to 0RPM inside of a blink of an eye. The CEL throws a clear "1444;" starter cranks healthy and motor turns over just fine, just no starting or running. I just moved and my Bentley's buried someplace. This could be so many things. Any ideas? TPS? ICV? Both? I've had no electrical issues up til now. Fuses are fine. Battery's new and seems to be powering everything. I had momentary near death experiances like that, and I traced it down to the ground wire between the chassis and the block. On older 5 series main and or fuel relays fail instanter. Fuel relay could be swapped w/ horn relay, whack main relay w/ screwdriver handle and see if it wakes up.... course on a '91 I could be way off base too..
Is the fuel pump running? Are you getting spark? 90 535i 5 Speed - Style 5 17"
DME relay i would assume, BMW recommends having a backup one in your car at all times. My fuel pump died like that. You can easily check if it is a fuel pump by spraying carb cleaner or something inflammable into the intake while somebody else is engaging the starter. In my case mechanic sprayed something called "Rapid Start". 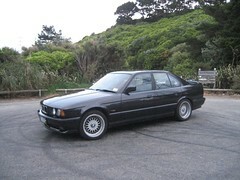 1994 520i with M50 engine, manual transmission and air conditioner. The POS hyundia I had did exactly the same thing, and the starter fluid trick helped us track it down pretty fast. Either you are not getting fuel or spark, and the fluid guarantees the fuel part of that equation. BTW, I got to personally witness the death of the worst car I ever owned ( I wanted to see it burn) and finally got back to BWM's. And what kind of a car it was that you executed it by burning to death? Sudden failure of fan clutch? 50-60 shimmy all of a sudden?